Meryl Streep appeared together with Billy Joel at a September 11 tribute in Central Park in New York and was part of a memorian ceremony. “The Hours,” expected to be one of the biggest crowd-pullers in the 59th Venice film festival at the end of this month, was pulled off the bill on Friday due to delays in post-production, organizers said. “The producer, Miramax, said that they still had to complete technical modifications… and it won’t be ready in time,” a spokeswoman for the festival said. EOnline has reported today that “The Hours” will have it’s world premiere at the Venice Film Festival, which will open it’s doors on Augut 29, 2002. Friends and colleagues will remember actress Irene Worth at a memorial service open to the public, at The Public Theater in New York City, 5 PM June 3. Expected to speak are Edward Albee, Christopher Walken, Mercedes Ruehl, Meryl Streep and Alan Rickman. Great news! 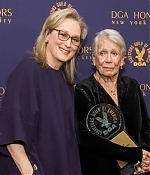 Meryl has been nominated for a 2001 Drama Desk Award for her performance in ‘The Seagull’ along with Robin Bartlett (Everett Beekin), Lindsey Duncan (Private Lives), Anna Paquin (The Glory of Living), Mercedes Ruehl (The Goat) and Sarah Jessica Parker (Wonder of the World). “The Seagull” is also nominated for Best Revial. The Drama Desk Awards ceremony will be held 9 PM May 19 at the F.H. LaGuardia Concert Hall at Lincoln Center. Hollywood luminaries Robert De Niro, Martin Scorsese, Meryl Streep and Edward Burns, present the first Tribeca Film Festival as a forum for emerging filmmakers and a means of stimulating economic activity in an a neighborhood that was hard hit after the Sep 11 World Trade Center attack. Some 40 features and 20 shorts will be screened in theaters and nightclubs throughout the area, and there will be a juried award for an emerging filmmaker and the best short film. After reporting about this project last year, the production has now started with an all-star-cast: Al Pacino, Meryl Streep, Emma Thompson and Mary-Louise Parker are going to play the leads in this six-hour miniseries for HBO. Mike Nichols directs. “Angels in America” will premiere in early 2003. Equality Now celebrates its 10th anniversary of fighting for women worldwide with an all-star gala at the Gramercy Theatre. Fauziya Kassindja, Alanis Morissette, Gloria Steinem, Kate Clinton, Edwidge Danticat, the Gina Gibney Dance Company and others will join the one and only Meryl Streep. Marie Claire sponsors (Text comes from Liz Smith’s Excite Column).